On the Main Line: Before Vellish,1 before Beit Yosef,2 Before Ari,3... a very old Torah. Before Vellish,1 before Beit Yosef,2 Before Ari,3... a very old Torah. 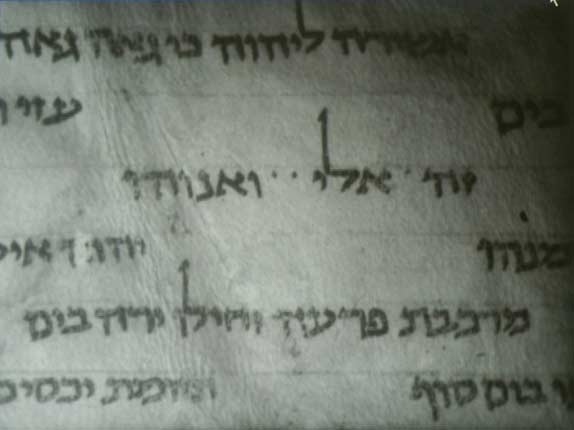 Ari posts about a Cairo Genizah fragment from a Torah scroll (from Ex. 13:19-16:1) that may be from the 7th or 8th century that will be displayed at the Israel Museum. Hebrew manuscripts before the 10th century are very rare, with the exception of the Dead Sea Scrolls (which was unknown until 60 years ago). Thus, there is a kind of gap between the 2nd or 3rd century and the 9th and 10th. Note the sirtut; note the absence of tajjin (not me'akev) and the form of the letters. So, how do they know it's a Torah scroll and not a chumash? I assume because it is from a scroll and not a codex (bound book), and that lines are scored (sirtut); a law required for Torah scrolls (and tephillin and mezuzot) but not regular books.